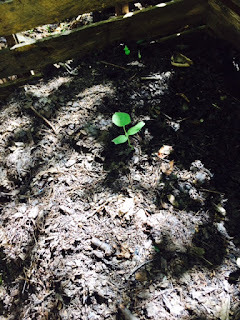 Planting Cabbages: Write With Me: Is Episodic Fiction Like a Shawl of Pumpkin Leaves? Write With Me: Is Episodic Fiction Like a Shawl of Pumpkin Leaves? I haven't blogged in a while and so I apologize for leaving you in a lurch of leeks or a gulch of gnocchi-- where are you and where have you found yourself these past few months? Over here in C'est si Bon! land, this September morning, summer has departed and the air is cool with golden light filtering through the dogwood tree. Acorns ping the stone patio and birds twitter about. It all seems peaceful, bucolic and rather sedate - but inside my writing room it is not. I am in the garden of revising this novel, The Way of Psomi, and have been lucky enough to get an evaluation from editor, Brenda Windberg of Free Expressions. You know the score, there is the news of things that are working, and the news about how the story would work better. My challenge is to more clearly draw the linear line from scene to scene so that the goal and the conflict within lead to a resolution and on to the next scene. I am going to do this, just hold your horses. I have just one thing to tell you. This morning began about nine hours ago, the cool air coming through the open window. From my writing room I can see the garden and it makes me happy to see pumpkins growing while I am working. Gosh those are some leaves, I thought. It was chilly enough to warrant wearing a sweater, and then with a gasp that startled the squirrels, I had a brilliant idea. I would craft an envious analogy between making a shawl of sorts from the immense pumpkin leaves lining the fence and episodic fiction and narrative fiction. Here's a cool piece about an episodic story called Birds, by John O'Brien. As it turns out some of my favorite stories are episodic: Don Quixote and Candide. And then there's Dan Holt who wrote, Ten Stories About Coyotes I Never Told You. Gosh, you think I've perfected this procrastination thing a bit too much? I've struggled most of the day to make this analogy and I think I've figured it out. 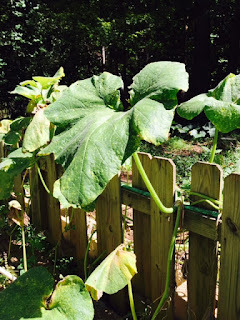 The theory being that pumpkin leaves, as they grow on the vine, have no particular linear line, You could drape them over your shoulders, again, no rhyme or reason, and have a perfect example of a shawl and of episodic fiction. Beautiful things strung together with no connection or inciting incident. My theory being is that pumpkin leaves meander all over the place; big and small, gnarly and with delicate little tendrils that hang on for dear life, They are, like life, like all beautiful things, that resist definition and just are. You can't change them. So I went out to the garden. Now I reached out my hand for the beautiful pumpkin leaves. I grabbed hold of the vine to lift them - not disturb them - and then, I screamed bloody murder! 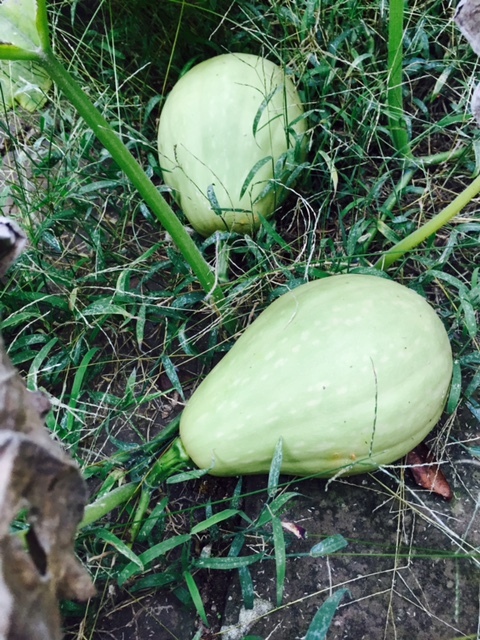 Do you have ANY idea how prickly pumpkin vines are? Excuse my language but they are the mofos of the vegetable world. Now I hate pumpkin leaves and totally like, screw them and their refined distant beauty. The idea of making a shawl out of them, turned my blood to stone. Goal. Make a shawl out of pumpkin leaves. Conflict. Pumpkin leaves tried to kill me. Resolution. Pull them all out! Pumpkin, you span spring, summer and fall, and I once worshiped you but then you tore up my hands. Your seeds, I might add, were saved by a dear friend (hmmm) and given to me for Christmas and then when the sun angled its way to us again, we kindly pushed into the dark dirt in April, and hoped for you. You sprouted double leaves (already I should have suspected as they were so huge) you were set firmly in the May ground. You grew those damn leaves even bigger and decided to crawl over the fence and grow like EVERYWHERE. Oh yeah, you do have beautiful flowers, but I ignored you, was too busy to pick you and fill you with cheese and fry you up, so is that why you got furiouser and furiouser at being ignored and made so many pumpkins? Just what did you think? Your job was to grow? Out here in the garden? And as for my theory? I learned once and for all, and the hard way, too, that pumpkin leaves are not like episodic fiction. Hardly. One leaf is connected to the other and pretty soon they are going to cover the school, and then as they cross the patio to the house, frost will nip their tender hearts and any hope they have of getting to me! There was a goal and a conflict, but the resolution is mine! All mine! Ha! Ha! Ha! I made a salad for lunch, (not of pumpkin though it should have been :) and as I carried the egg shells and carrot skins to the compost bin I beamed a smile to the heavens and danced a jig over the empty-of-pumpkin ground. And guess what had the nerve to show itself to me? Another pumpkin, sprouting out of the compost pile. And, PS there will be lots of pumpkin recipes, to come!